This home really is spacious, lovely and charming throughout. There are three double bedrooms, all with ensuite bathrooms; the living room has a fireplace with wood burner and French windows leading to a terrace and the kitchen/dining room has the white goods included and also has French windows from the dining area to the garden. The gardens are beautifully mature and have many trees, including peppercorn, fir, orange and a wonderful orchid tree; there is that all important swimming pool and various seating areas, depending on if you want somewhere sunny (a huge roof terrace with BBQ), or a lovely shady spot (under the trees). 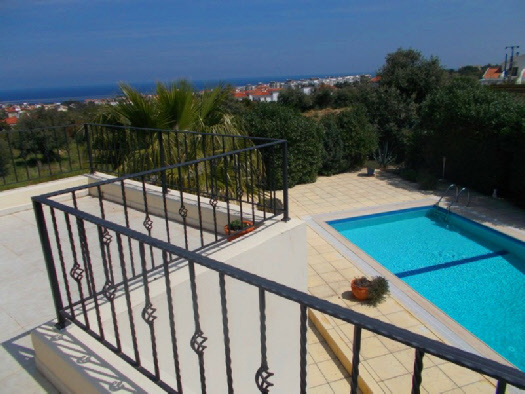 You have superb mountain and seas views and you are just a 5 minute drive to the supermarkets, restaurants and beaches! What a gem of a home this is! Range of wall and base units. Dishwasher, oven, hob and fridge freezer. Dining table and chairs and French windows to garden. Door from kitchen leads to the utility room. Spacious living room with fireplace and log burner, air conditioning and French windows to a large terrace. This wonderful home sits on a large corner plot and has a 10 x 5 overflow pool with plenty of terracing around. There is also terracing from both the dining area, living room and front bedroom; you also have the huge roof terrace with BBQ from the landing, giving lovely mountain and sea views. There is a garden shed, a log storage area and a patio area, ideal for dining table and chairs. The gardens are lovely and mature and have many trees, including peppercorn, fir, orange and a beautiful orchid tree. The property has a stone boundary wall and private parking for 2/3 cars. A hugely popular and very large area centred around what was once a small old village which has now expanded to include some of the most popular North Cyprus beaches, hotels and restaurants and supermarkets. The huge leaning monument on the coastline marks the beach where the Turkish troops landed in 1974 to free the Turkish Cypriots from their oppressors. Being such a huge district means there has been plenty of space for development without ruining the beautiful North Cyprus scenery and there are some fantastic new Northern Cyprus properties available throughout this area. With plenty of hills and ravines Alsancak has some excellent elevated positions with fantastic views of the Mediterranean Sea where on a clear day (of which there are many!) you can see the Southern mountains of Turkey on the horizon.